Medicare Part D Coverage Phases - How does Part D work? Medicare Part D Coverage Phases: How does Part D work? UPDATED Jan. 12, 2019. There are four Medicare Part D coverage phases (stages). The numbers below are for the year 2019. The Annual Deductible is amount you must pay for your prescription drug plan before plan starts to pay. In 2019 the deductible is $415. During the Initial Coverage you pay for each covered drug a copayment/coinsurance (defined by the plan), and the plan pays its share. The typical coinsurance is 25%, i.e., you are paying 25% of the drug costs, but the insurance company pays the rest. The initial coverage continues until the total drug costs (total of what you’ve spent and what the insurance company paid) reach $3,820. You pay a 25% of the expenses between $415 and $3,820. Once the total costs of prescriptions (paid by you and your plan) have reached $3,820, you are paying ALL drug costs (based on discounted prices) until you’ve spent total $5,100 out-of-pocket. This does not include the cost of monthly premiums (you must continue to pay them), but it does cover yearly deductible and coinsurance/copayments. 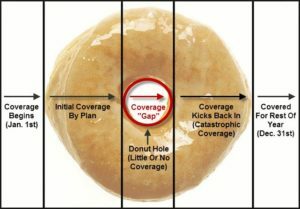 This period is known as the DONUT HOLE. In 2019, during the donut hole, you’ll get the following discounts on your prescriptions: 75% of the price of the plan-covered brand drugs and 63% of the generic plan-covered medicines. Nevertheless, you can count the prescription’s full cost towards the amount you are required to spend to be qualified for catastrophic coverage. 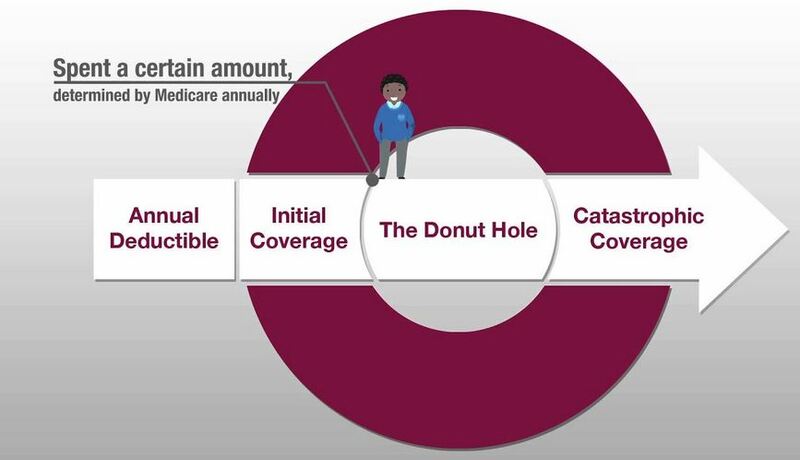 Catastrophic Coverage is the last stage of Medicare Part D Coverage Phases. Once you’ve spent $5,100 out-of-pocket during the year of the Medicare Part D plan, the coverage gap ends, and catastrophic coverage begins. You are only paying the greater of either a small coinsurance (5%) or a small copayment ($3.40 for generic drugs or $8.50 for brand-name drugs) for each drug until the end of the calendar year. Please note that the dollar amounts above represent the MAXIMUM of allowed. Some plans may have numbers below the maximum. Our services are offered at no cost to you. If you are considering a Medicare Prescription Drug Plan, let us help you.